Water, in any context, is important within Muskoka. It is the connecting thread within our ecosystems that ties everything together. The air, soil, plants, animals, people, and water are all interconnected, all part of a watershed. We all live in a watershed and our individual actions can directly affect it. Working together using a watershed approach will help protect our water resources. 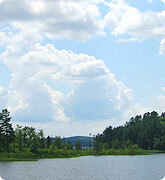 Learn about Muskoka's watersheds, lakes and wetlands. Learn about managing water levels. What affects water quality and how it is measured? How can we care for our water? Looking for information about the Muskoka River Water Management Plan? Find out which species are at risk in Muskoka. Learn about Muskoka's watersheds and the Species at Risk that live in them. What are the different physical, chemical and biological characteristics of our lakes? Why are wetlands important for the health of our water? Information about water levels and the Muskoka River Water Management Plan. What impacts our water quality and how do we keep our drinking water safe? What is monitored, who monitors, and how you can help. Information about how Muskoka's water is cared for and about Muskoka's Heritage Areas program.